Gagnon, M.A, & Wolfe, Sidney. (2015, July 23). 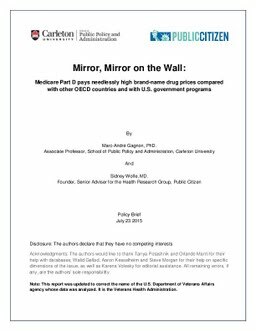 Mirror, Mirror on the Wall: Medicare Part D pays needlessly high brand-name drug prices compared with other OECD countries and with U.S. government programs. School of Public Policy and Adminstration / Public Citizen.